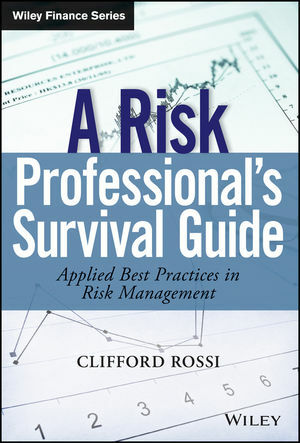 A Risk Professional's Survival Guide fills a critical gap left by existing risk management texts. Instead of focusing only on quantitative risk analysis or only on institutional risk management, this book takes a comprehensive approach. The disasters of the recent financial crisis taught us that managing risk is both an art and a science, and it is critical for practitioners to understand how individual risks are integrated at the enterprise level. This book provides the element of hands-on application necessary to put enterprise risk management into effective practice. The very best risk managers rely on a balanced approach that leverages every aspect of financial operations for an integrative risk management strategy. With this book, you can identify and control risk at an expert level. CLIFFORD ROSSI is Professor-of-the-Practice and Executive-in-Residence at the Robert H. Smith School of Business at the University of Maryland. He also has nearly 25 years' experience in banking and government. Dr. Rossi's most recent position was Managing Director and Chief Risk Officer for Citigroup's Consumer Lending Group. He has also held senior risk management positions at Freddie Mac and Fannie Mae. Dr. Rossi is frequently quoted on financial policy issues in major newspapers and has appeared on Fox News, C-SPAN, and CNN's Situation Room.